The Austin American Statesman reported May 10, 2009 that 24% of new homes being built in Austin qualify under Austin Energy's green building program. Taken for a Ride is a documentary using historical footage and investigative research funded by the Independent Television Service that looks at GM and its creation National City Lines and the destruction of the electric rail lines within major cities in the USA. The entire documentary can be viewed below, at the newday.com website or on Google Video. Thanks from Gary from the San Antonio Environmental Meetup for pointing out this video. Some members of San Antonio Sustainable Living have had difficulty finding insulating spray foam contractors willing to take on remodeling projects. There seems to be plenty of new construction work to go around for them, though as the number of contractors increases that may change. 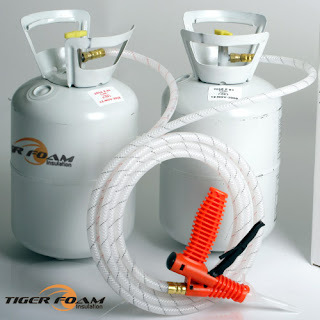 For the avid do-it-your-selfer there's an alternative: Tiger Foam Spray Foam Insulation Kits. Tiger Foam offer kits, nozzles, even protective clothing. Kits are shipped by UPS freight. Shipping for the 200 board feet kit would be about $75 to San Antonio. They sell a fast rise formula foam for open applications and a slow rise low pressure formula for filling wall and block cavities. Their closed cell product expands at an 8 to 1 ratio, so that one inch of spray would expand to eight inches of foam. Tiger Foam® quick curing, disposable, two-component spray polyurethane foam insulation kits are manufactured to ASTM E-84 Specifications and classified as a fire-rated foam insulation. Our spray foam insulation is manufactured using the most environmentally friendly blowing agents and fire-retardant chemicals available today and DOES NOT contain CFCs, VOCs, Formaldehyde or PENTA-BDEs.We are the ONLY supplier offering E-84 Fire Rating STANDARD in our surface spray product line. Technical support is offered by phone. But they suggest that you review the wide variety of information available in pdf form from them before making any purchase. From looking at the site it seems like though they make it as simple as possible, a realistic evaluation of one's abilities would be in order before undertaking such a project. Our friends in Austin, Design, Build, Live are sponsoring a series of events around rainwater harvesting. This post focuses on one of the events surrounding the visit by Brad Lancaster. A dynamic slide presentation on how to integrate rainwater, greywater and stormwater harvesting to create water abundance in place of water scarcity. Practical, doable, inexpensive ways to maximize the use of rainwater. Book signing follows the presentation. Admission – $15 in advance, $20 at the door. $13.50 for DBL Donor Partners (Check out the many advantages of being part of DBL.) Advanced registration recommended. By now, we all realize there needs to be a big change in the way production home builders build homes. It’s unrealistic to think that all builders will suddenly build the best category of deep green homes, but if a notable percentage of builders were to build houses twenty to thirty percent more energy efficient than a conventional house with only a few modifications to the way they are building today, it would be a great way to start to turn around the homebuilding industry. In order to do that, there needs to be more examples of high-performance green houses designed and built in a way that the majority of homebuilders can build without having to re-learn everything. Griz and Karen Adams are building such a house southwest of Boerne. If it weren’t for seeing the top of rainwater cisterns, it would look no different from a conventional house. However, the Adams’ home, when completed will include some very progressive green building elements. The Alamo Drafthouse Cinema and Solar San Antonio would like to invite you to a series of environmental films to be showing the third Thursday of every month. On Thursday May 28th, at 7:30 pm see Addicted to Plastic at Alamo Drafthouse Westlakes, 1255 SW Loop 410, San Antonio 78227. All ticket proceeds will benefit Solar San Antonio. Homegrown is the inspiring true story of the amazing Dervaes family who are living off the grid in the heart of urban Pasadena, California. They harvest over 6,000 pounds of produce on less than a quarter of an acre while running a popular website that is known around the world. The film is an intimate human portrait of what itʼs like to live like Little House on the Prairie in the 21st Century. The family is quite web savvy with four websites, Path to Freedom, Peddler's Wagon, a social networking site Freedom Gardens and Little Homestead in the City. The DVD is available for purchase now, but the film is also on the festival circuit, so keep an eye out for it. 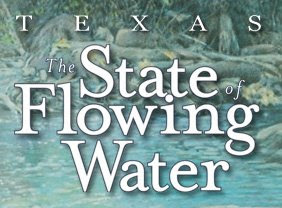 The Texas Parks and Wildlife Department with financial support from the San Antonio River Authority, the Brazos River Authority, Sport Fish Restoration and the Texas Water Foundation produced "Texas, the State of Flowing Waters". The fifty-five minute documentary can be watched in segments on line or you can read the transcript. The film looks at the controversial plans of the city of Dallas to dam the Neches river and at alternatives to damming the main channel of a river. 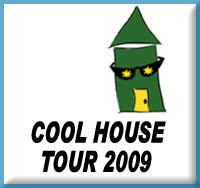 The Texas Solar Energy Society presents the 2009 Cool House Tour, June 28, 2009. For San Antonians this is a great event to which to carpool. Be sure to check out our Facebook group. It will be a "related event". This is a great opportunity to visit some of Austin’s best examples of sustainable home design. A $15 guidebook to the locations serves as your ticket and provides directions. They go on sale at Austin Central Markets Westgate , Austin Central Market North Lamar and online at the Texas Solar Energy Society website June 1, 2009. Each project will have a full page devoted to its significant features and sustainable highlights, along with photos, so you can choose what you want to see and go at your own pace. I've attended these tours in the past and they are filled with surprises, inspiration and interesting buildings. Green Camp SA Report 3: Texas Rainfall Catchment offers rainwater collection help from with in San Antonio. One of the impromptu presenters at San Antonio Green Camp was Jim Champion of Texas Rainfall Catchment. Jim is located in San Antonio. He holds the designation Accredited Rainwater Professional from the American Rainwater Catchment Systems Association. His website includes advice to those investigating catchment whether for drinking or for landscaping. he also includes a link to a Rainwater calculator which will help you figure out how much rain you can collect from your roof. He even includes a rough estimate of costs. The range of services he offers includes turn-key systems all the way to help for homeowners wanting to build their own. He installs gray water systems as well. Labels: gray water, Rainwater harvesting, San Antonio. The way you think of rainwater and stormwater will be forever changed! Brad Lancaster’s integrated, sustainable approach to harvesting and maximizing water for the home, landscape, garden, farm and community is eye opening. Brad has written and spoken extensively about maximizing the potential of our on-site resources - topsoil, sun, plants and WATER. Come to one or all events and learn how to turn water scarcity into water abundance! Find full details on the Design Build Live page: Rainwater Harvesting Rock Star Comes to Austin. Thanks to SASL member Joe Barfield for passing on this link via our Facebook group. Previous posts about Brad's work include: Radically Simple Sustainable Living (on the cheep!) and mostly at the library, Brad Lancaster's Rainwater Harvesting Basics Part 1 & 2 and Brad Lancaster will Revolutionize your thinking about Rainwater Harvesting. Solar San Antonio's 10th anniversary celebration on Tuesday, May 19 is going to be amazing. Jigar Shah, visionary founder of SunEdison and proponent of the power purchase agreement model that has driven growth of the solar industry, will keynote the event and we expect some fireworks! You can read a great profile on Mr. Shah at On Earth.org . And now we’re super excited about an extra opportunity to make sure that people like you who are truly passionate about solar now can attend at a special discounted rate. Tickets are priced at $96 in honor of Bill Sinkin’s 96th birthday. Very cute, but in this economy it’s just too much for some. So NuStar Energy has generously donated seats so that 20 people can attend the luncheon at half off the normal ticket price of $96. That’s right - $48 for a once-in-a-lifetime opportunity to hear an informative, challenging and thought-provoking talk with Jigar Shah, plus lunch at the Pearl Stable and the opportunity to network with leaders in energy and sustainability from around the region. You can’t beat that. So the first 20 people to rsvp online at http://solarsanantonio.eventbrite.com using the special discount code THXNUSTAR will get the special $48 tickets. Hurry! Won’t last long! If anyone has questions, call 210.313.2445. Luncheon & program from 12:00 p.m. –1:30 p.m. If you have been looking into becoming an Artisan/Applicator of American Clay’s Earth plaster products don’t miss this opportunity. This Two day Advanced Applicator training will cover everything you need to know about applying American Clay’s Earth plasters. You will also get a certificate of complication from a certified American Clay instructor (Tim White) upon completion for this course. This certificate along with applying 1000 square feet of American Clay plaster and sending American Clay a client reference is the easiest way to get listed on American Clay’s web site as an Artisan/Applicator. Energy Star Appliance Texas Sales Tax Holiday: 12:01 AM May 23 to 11:59 PM May 25. During Memorial Day weekend, Texas shoppers get a break from state and local sales and use taxes on purchases of certain energy efficient products. The 2009 Energy Star sales tax holiday begins at 12:01 a.m. on Saturday, May 23, and ends at 11:59 p.m. on Monday, May 25 (Memorial Day). The tax-free holiday also applies to Internet and catalog sales of eligible products, provided that (1) the items are both paid for and delivered to the purchaser during the exemption period; or (2) the purchaser orders and pays for the item and the retailer accepts the order during the exemption period for immediate shipment, even if delivery is made after the exemption period. The retailer accepts an order when the retailer has taken action to fill the order for immediate shipment. Actions to fill an order include placement of an "in date" stamp on a mail order and issuing a confirmation verifying the date the seller accepted the order. An order is considered "for immediate shipment" even if delivery or shipment may be delayed because of a backlog of orders or because an item is temporarily out of stock or on back order by the seller. Layaway plans can be used to take advantage of the sales tax holiday. Layaway sales of eligible products qualify for the exemption when either the final payment on a layaway order is made and the merchandise is given to the customer during the exemption period, or the item is selected by the customer and the order is accepted into layaway by the retailer during the exemption period for immediate delivery upon full payment, even if delivery is made after the exemption period. Delivery, shipping, handling or transportation charges connected to the sale of a qualifying item purchased tax free during the sales tax holiday also qualify for the exemption. Such charges are included as part of the sales price of qualifying products sold during the holiday whether separately stated or not. For example, assume a retailer sells an Energy Star-rated dishwasher tax-free during the sales tax holiday and charges the customer an additional fee for delivery. The entire amount billed to the customer for the purchase and delivery of the qualifying appliance is exempt from tax, even if the delivery charge is separately stated or billed after the sale. Shipping and handling charges must be properly allocated when a package or delivery contains both exempt and taxable items. For example, assume a retailer sells an Energy Star-rated clothes washer tax-free during the sales tax holiday. The same customer also purchases a clothes dryer, which does not qualify for the exemption. The retailer charges the customer an additional fee of $25 per appliance for delivery. The $25 delivery fee connected to the delivery of the qualifying exempt clothes washer is exempt from sales tax, but the $25 delivery fee connected to the delivery of the taxable clothes dryer is subject to tax. However, if the delivery charge is a flat rate per package or delivery address and the amount charged is the same regardless of how many items are included in the package or delivery, for purposes of the exemption the total charge may be attributed to one of the items in the package rather than proportionately and separately allocated between the items. For example, assume a seller charges a flat fee of $50 per customer address for delivery regardless of the number of items delivered to that address. Assume that during the sales tax holiday a customer purchases a qualifying Energy Star-rated refrigerator tax-free, a taxable stove and a taxable microwave and the seller charges the customer the flat fee of $50 for delivery of all three items. Under these facts, the seller may attribute the $50 charge for delivery to the sale of the refrigerator (a qualifying exempt item) and does not have to allocate the delivery charge between the refrigerator, stove and microwave. If the charge is attributed to the refrigerator, then the entire flat fee delivery charge qualifies for the exemption. The sales invoice must clearly identify that the delivery charges were attributed to the exempt item and separately state the tax due on the non-qualifying merchandise. Items that are free-standing or mobile, such as clothes washers, dehumidifiers, refrigerators, portable dishwashers and window or room air conditioning units are tangible personal property. If an item retains its identity as tangible personal property after installation, then installation charges billed by the seller of the item also qualify for the sales tax holiday exemption - even if the installation is performed after the holiday period is concluded. Items such as programmable thermostats, central air conditioning units, ceiling fans and built-in refrigerators and dishwashers that are plumbed, wired or otherwise permanently attached to a building structure are improvements to real property. For items that are incorporated into realty, the taxability of the installation labor is determined by the type of jobsite. Labor charges are not taxable on new construction and residential repair and remodeling jobsites. Therefore, no tax is due on charges for installing items such as ceiling fans, programmable thermostats or central air conditioning units in residential property or during a new construction project. See Comptroller Rule 3.291, "Contractors," for more information. Nonresidential repair and remodeling is a taxable service. Therefore, tax is due on charges for installing ceiling fans, built-in appliances, programmable thermostats and central air conditioning units in nonresidential real property, regardless of when the installation is performed. Charges for installation performed on existing nonresidential real property should be separately stated on the invoice from the sales price of the qualifying Energy Star-rated item. A lump sum charge for the purchase of an Energy Star item and installation is subject to tax as the purchase of nonresidential repair and remodeling. Sellers may not advertise or in any way promise to pay or not charge sales tax that is due on the sale of taxable items. See Tax Code Section 151.704. Sellers may, however, advertise that tax is included in the sales price of the taxable items that they sell. 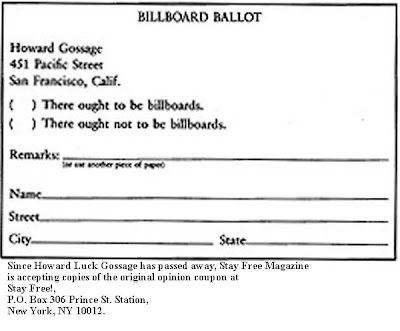 In an essay that is as provocative today as it was in 1960 when it was published, advertising man Howard Luck Gossage, the "Socrates of San Francisco" asked in Harpers Weekly if billboards had a right to exist. He argued that they did not because were an intentional invasion and theft of our personal airspace which unlike other visual nuisances such as garbage dumps existed only to invade our personal space. He advised not to argue against billboards on aesthetic grounds, "It is like arguing that mice should be kept out of the kitchen because they don’t match the Formica. What a billboard looks like has nothing to do with whether it ought to be there. Nor does the fact that it carries advertising have anything to do with it, either. It would be the same thing if it were devoted exclusively to reproductions of the old masters; just as the open range would have been the same thing if they had only run peacocks on it. The real question is: has outdoor advertising the right to exist at all?" Alesh Houdek writes that he became so excited when he found Gossage's February 1960 essay at the Stay Free! Magazine that he "whipped up a little home on the internet for it." You can read the whole essay at howtolookatbillboards.com , Stay Free Magazine.org or the Harpers Magazine online archive (free with current paid subscription). Since Howard Luck Gossage has passed away, Stay Free Magazine.org is accepting copies of the original opinion coupon at Stay Free!, P.O. Box 306 Prince St. Station, New York, NY 10012. So print it out, mail it and let them know what you think. How to make rainwater safe for drinking is an issue that concerns our health officials and homeowners. Jody L. Grenga's affordable rainwater system includes a Berkey Light filtration system adapted for home use. Note, that is is just part of a much more complex system. 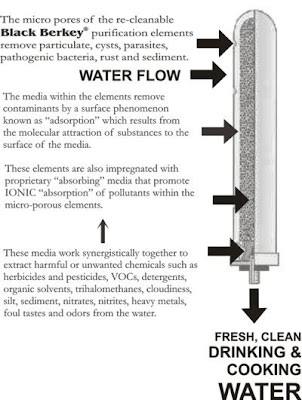 Berkey Water makes gravity fed filtration systems that are meant to filter out pathogenic bacteria, cysts and parasites as well as unhealthy chemical contaminates and impurities. Although Jody Grenga utilizes them as part of her rainwater purifying regime, they are designed to stand alone. Models include the Travel Berkey, the Sport Berkey backpack bottle, the Big Berkey, the Royal Berkey for large families, the Imperial Berkey for small to medium groups and the Crown Berkey for medium to large groups which will purify up to 6.5 gallons per hour. Berkey Water (New Millenium Concepts Ltd.) is headquartered in Arlington, Texas. This is the story of the construction of the luxury MacAllen Building Condominiums in Boston which earned LEED Gold status. It is the story of the construction workers who had never been involved in building anything green and some of whom have never heard the term "green" construction. The DVD is being sold for $24.95 for home use or for $295.00 to librarys and schools. Netflix doesn't have it, but it has been on the Sundance Channel. Leslie Provence publishes the San Antonio Food Policy Forum which addresses issues related to sustainable food supplies. She was one of the surprises of Green Camp San Antonio for me. Topics of her posts include Urban Agriculture, Buying Local, and the Food Policy Movement. Subscribe to her blog and keep abreast of developments in San Antonio food, and check out San Antonio Foodshed for links to growers in the area. San Antonio's own Build San Antonio Green was honored by the National Association of Home Builders at their National Green Building Awards ceremony May 11, 2009 in Dallas. Specifically Build San Antonio Green and the Missoula (Mont.) Building Industry Association were honored as the local green home building programs of the year. Local builder Imagine Homes was also honored for the second year in a row for the Affordable Home of the Year. Concept Home of the Year - CVH Inc. (Clifton View Homes), for a home in Coupeville ,Wash. Tight insulation and other energy-efficient features meant homeowners spent $76 on electricity in the first month they lived there – and that was before the builder installed photovoltaic panels on the rooftop and the monthly bill became a credit, rather than a debit, Ferrier said. Luxury Home of the Year: Solaire Homebuilders of Bend, Ore. With beautiful interior finishes, this custom home was built with reclaimed and recycled materials and designed to be 60 percent more energy efficient than required by code. Production Home of the Year - Celebrate by Del Webb, an active-adult community in Fredericksburg, Va., is taking green features to a larger scale and now certifying the homes in this new development to the National Green Building Standard. Single-family Remodeling Project of the Year - Honors went to Red-B Construction for a Durham, N.C., home with striking design and extensive use of deconstruction techniques that improve resource efficiency. Multifamily Remodeling Project of the Year - Hardwick G.C. Inc. of Orlando, Fla., turned an early 20th-century bungalow into a charming duplex that has a rainwater harvesting system, native landscaping and other water-efficient features. Multifamily Rental Project of the Year - Tonti Properties’ 270-unit community in Frisco, Texas, is the first Energy Star-certified development in the region. The company created an on-site tree farm during contruction to enable landscapers to replant trees moved during the building process. Condominium Project of the Year - Onion Flats LLC of Philadelphia created an 8-unit infill project in the Northern Liberties neighborhood featuring slick, modern design, solar panels, green roofs and great city views. Townhouse Project of the Year - Asdal Builders LLC was honored for a New Jersey rental development that caters to senior citizens and focuses on sustainable, low-maintenance design and cost-effective geothermal heating. Development of the Year - The community of Woodlands Edge in Little Rock, Ark., developed by Rocket Properties LLC has nature trails, wildlife preservation areas and an extensive education program for its residents focused on environmental stewardship of the grounds. The city of Chicago was named Governmental Advocate of the Year for its extensive voluntary energy-efficiency improvement programs and for encouraging green roofs on high-rise buildings. EcoBroker International won Group Advocate of the Year honors for its green building education efforts among real estate brokers. Donna Shirey, a longtime NAHB Remodelers leader and green-building professional from Seattle, was honored as Remodeling Advocate of the Year. Architect Michelle Kaufmann, known for her groundbreaking green and modular design, was named Individual Advocate of the Year. John Freer, a longtime Missoula BIA leader and founder of the association’s green building council, was honored as NAHB Green Builder Advocate of the Year. recycled cellulose, 25% cementitious material, and 10% natural additives. Come join us to discover more about our “one step building process”. • Experience a hands-on demonstration. In the past decade many builders have taken another look at lime as a building material. Lime has been used for millennia, but in the 1800’s it was replaced by portland cement as the main binding materials in construction. Sand gradation and particle size and how they can effect stucco strength; what a Balance Mix is; mixing, applying and compressing finish coat lime plasters and applying colored limewash. This is a hands-on workshop, and participants must bring protective equipment for eyes, hands, and body, a hawk and trowel; and a desire to learn. The first Green Camp San Antonio attracted over 100 attendees, which the organizers said was more than usually attends camp un-conferences and which is clearly a lot of people to show up at a San Antonio environmental event that didn't feature face-painting or tree giveaways. Presentations included one by the Consumers Energy Coalition, a local group opposing nuclear energy. Other topics included permaculture, rainwater catchment, food policy, aquaponics, efficient air conditioning, Mission Verde, biofuels, gardening, natural building, electro-magnetic pollution, public transportation, electric cars and green building. The un-conference came together without any pushing or shoving when the moderator announced that the time had come to fill in the four boards with topics of workshops. Attendees could fill in the name of a topic on which they were willing to speak or they could pose a question and trust that people who knew the answer would come. Thirty minutes was allocated for each and there were four presentations going on at all times. Each was very interactive with attendees likely to have information that the presenter did not. Look for another Green Camp San Antonio at least by next year. T-Shirts are available and their purchase might encourage the organizers to stage another one sooner rather than later. Jody LaRaine Grenga. author of A Year of Drinking Berkey Purfied Rainwater is the featured presenter at May's Design Build Live Meeting. Here is an article about her system from lifegetinit.com. 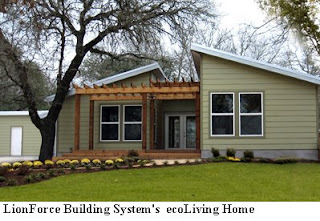 Winner's of San Antonio's first Green Building awards include LionForce Building Systems who presented at the San Antonio Sustainable Living's September meeting and Imagine Homes who was featured in a post April 11. Imagine Homes won in the Residential Production Home category while LionForce won in the Residential Custom Home under 2200 sq feet category. LionForce uses a proprietary wall and ceiling system somewhat similar to the STEP panels featured in our April 10, 2009 post in that they combine polystyrene for insulation with load bearing steel framing. The award for Residential Custom Home over 2200 sq feet went to Kyle Lindsey Custom Homes, a participant in the 2007 and 2008 Parade of Homes. Their homes feature blown insulation, foam insulation and well ventilated attics. George Paul Swanson seminars: May 16 & 17 "Buildings that Heal" and "Breathable Building Materials"
Austin builder, designer and author George Paul Swanson will present workshops on May 16 and 17. On Saturday May 16 at Radiance Living Center, 107 Concord Cr, Austin Texas it's "Buildings that Heal" based upon his book "Breathing Walls". Learn time honored traditional building techniques in light of modern science. 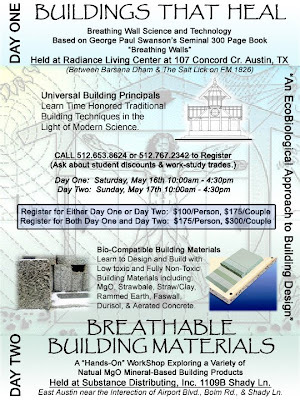 On Sunday May 17, at Substance Distributing 1109 B Shady Lane, Austin, he presents "Breathable Building Materials". Learn to design and build with low toxic and non-toxic building materials including MgO, strawbale, straw/clay, rammed earth, faswall, durisol and aerated concrete. SASL April Meeting: Joseph De Los Santos of Earth Wise Organic Pest Control explains safer methods to handle insects. At every San Antonio Sustainable Living meeting, we promise the chance to learn something new and green. Our April 28 session featured a talk by Joseph De Los Santos, owner of Earth Wise Organic Pest Control. From attending our meetings in previous years I knew about using borates to stop termites and baits to draw ants out of a dwelling, but Joseph has many more tools in his kit, including essential oils that drive out fleas and roaches. His approach requires the cooperation of home and business owners. The food sources for insects must be addressed. * The key to getting rid of fleas is to work with the Earth Wise treatments, i.e., trim your grass. * Nematodes (microscopic, nonsegmented worms) destroy fleas, but you will need to keep the soil moist. * In TX, a company has to use chemicals to treat/prevent termites. * Earth Wise uses a foam containing the same chemical as in Frontline and injects it into pinholes in the walls. The foam will block entrance ways (plumbing) and the chemical will kill whatever is living in there. For new builds he will guarantee this treatment for 10 yrs (I think it was). * Mint apple jelly mixed with boric acid or vinegar was also suggested for ants. Wasps are good unless they are aggressive. . They are insectivores. If you don’t go near them they will leave you alone. In general, whatever organic solution/program that Joseph and company develop for your situation, you and the rest of your household have to agree to do your part in maintaining the right environment to keep the pests away. Earth Wise does comprehensive clean-up of restaurants and training of employees to keep the premises clean and vector free. But, if store management will not commit to following the proper methods, then he will limit his work to periodic clean-ups. Blown cellulose insulation is another service offered by Earthwise. Green Podcast collection: "Sustainable Building Conversations with people involved with sustainable buildings with Doug Pilgrim "
Doug Pilgrim's podcast series "Sustainable Building Conversations with People Involved with Sustainable Buildings" includes interviews with a variety of people from Scott Kellogg to Paul Hawken to The Greasy Brothers. It's free and online at sbpradio.googlepages.com or from itunes. Austin's Rhizome Collective offers vision and methods of sustainable city living. The Rhizome Collective was recently evicted by Austin code enforcement officials from the building they'd occupied and transformed since the year 2000. Their warehouse home featured wind power, rainwater catchment, aquaculture and a lush permaculture food forest. 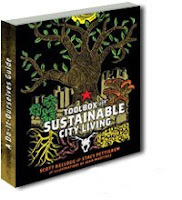 In 2008 they published, Toolbox for Sustainable City Living, A Do-it-Ourselves Guide by Stacy Pettigrew and Scott Kellogg. Illustrated by Juan Martinez and Beth Ferguson . The Toolbox for Sustainable City Living is a DIY guide for creating locally-based, ecologically sustainable communities in today's cities. Its straightforward text, vibrant illustrations and accessible diagrams explain how urbanites can have local access and control over life's essential resources: food production, water security, waste management, autonomous energy, and bioremediation of toxic soils. Written for people with limited financial means, the book emphasizes building these systems with cheap, salvaged and recycled materials when possible. This book will be an essential tool for transitioning into a sustainable future threatened by the converging trends of global warming and energy depletion. SASL member Joe Barfield writes" It has taken me around the corner in terms of a practical understanding of how much I can influence my immediate environment and destiny. " He has pointed out links to interviews with Pettigrew and Kellogg. Sustainable Building Conversations with People Involved with Sustainable Buildings. Joe's favorite Kellogg recording is available on iTunes. It was recorded at Washington College in Chestertown Maryland, March 22, 2009. Toolbox for Sustainable Living, Scott Kellogg Cofounder of the Rhizone Collective. Album: Center for Environment and Society. You can also download a short video about their clean-up a brown field site in Austin. Christa Emrick at Cme-change.com continues tradition of raw food advocacy in San Antonio. In Helen Nearing's Simple Food for the Good Life, she recalls her friend Dr. Herbert Shelton, who advocated in favor of eating raw food at his health school in San Antonio. She listed his six disadvantages of cooking and nine advantages of raw foods. That tradition of raw food diet instruction in San Antonio is being continued by Christa M. Emrick, a certified Alissa Cohen "Living on Live" chef and black hat feng shui practitioner. She offers several un-cooking classes each month. Among her classes are: Alissa Cohen’s Chef Level 1, A Primer on Salads and Salad Dressings, Desserts âu Naturél!, Lettuce Toast to Your Health! Salads Beyond the Greens! and Smoothies, Juices, Mylks and Soups. Her Dining Around the World series features Asian, Indian, Mexican, Italian, Mediteranean and Mexican inspired raw food dishes. Everyone loves Mexican Food but can the raw version taste just as satisfying as its traditional version? In this class you will learn how to use a food processor, dehydrator and practice your knife skills. * How to use a dehydrator to make thick, crispy chips as well as flexible wraps for tortillas. * How to hone in on your knife skills or use a handy gadget to create the perfectly shaped salsa. * How to use shredded cabbage to replace rice for a lighter version. * How to create a flourless chocolate cake. MENU: Hot Red Pepper Chips, Salsa Fresca, Guacamole, Mexican Style Seasoned Cabbage, Chalupas, Chili Lime Fries, Chocolate Cake. Raw food recipes can be simple and surprising. For instance, she recommends combining avocado, frozen strawberries or frozen blueberries with a sweetener such as agave nectar in a blender for a raw food version of ice cream. You can register for her classes at rawteacher.com. She also has a raw foods meetup group you can join. Labels: Events, Food, San Antonio. San Antonio Sustainable Living member and owner of Solar Texas(soltx.com), Tony Stephenson, explains the effect of the sun on a simple ventilated attic, as contrasted to a ventilated attic with an attic fan. #1 - A home with simple vents and no attic fan. 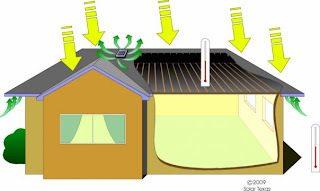 Effects of the sun's heat on a home in the morning: Attic is about the same temperature as the ambient temperature. The sun hits the roof and the attic starts to warm. Towards the afternoon, the attic is considerably hotter than ambient. Air has expanded with the heat in the attic. There is so much heat, the vents and soffits just allow the attic air room to expand...everywhere. The hot air pushes out from the vents and soffits and gable vents. Ideally, it would be great to have fresh, outside air coming in under the eaves through the soffits or gable vents, across the ceiling joists and rafters and out the vents on top of the roof. This is what a good solar powered attic ventilation fan is designed to do. #3 - A home with simple vents - no attic fan. In the evening, insulation holds in the heat from the day like a sleeping bag left out in the sun. Cool, humid night time air returns to the attic as the attic cools and the air brings moisture with it. Process repeats every day. When installed, a solar powered attic fan comes on when the sun comes up and goes off when the sun sets and will keep the attic close to ambient temperatures all day. In doing so, the extreme temperature variations are minimized and moisture and mold issues are virtually eliminated. The AC ductwork is usually in the attic and keeping the attic close to ambient allows the AC system to work a little easier. My best results have been with attic fans near roof peaks with ample airflow from the attic extremities. Best result was with a home in Shavano Park where the homeowner's utility bill went from $385 in May 2008 to $247 in July (not a scientific evaluation). Fans were installed in mid-June. A good attic fan should draw at least 1150 cubic feet per minute (cfm) of airflow. Anymore than 1575 cfm will start to bring conditioned air up from the home below through light fittings and other ceiling penetrations. #4 - A home with solar attic ventilation fan in the afternoon. With a good solar attic ventilation fan, the heat from the sun doesn't get a chance to build in the attic. The fan comes on when the sun is shining on the roof and brings a flow of fresh air through the attic. The fan comes on in the morning, even before the heat in the attic starts to build. Originally posted to the SASL Facebook group. I have been researching ways to reduce water and energy waste in my life. Elegantly. Not with complicated stuff. Tanks aren't required to collect rainwater. Solar panels aren't necessary for capturing the sun's energy. Tanks and panels do have their place, but I lean towards cheap and easy. The Rhizome Collective has done an impressive job of enacting simple permaculture and sharing it with the public. A phenomenal resource to calibrate your brain for true sustainable living. Brad is a charismatic rainwater guru from Arizona. I highly recommend you Google him and visit his site and watch the few videos of him. Simple changes in the contours of your yard can retain thousands of gallons of water. Maybe I am too demanding of the plants I put in the ground. Aren't beauty, oxygen production and shade enough to justify a few square inches and a splash of water? I lean towards plants that offer up some food for my family or my chickens. If it's a perennial, all the better! Art has provided me with wise counsel - Slow Down! I look forward to water trees with my laundry water, but I don't want to burn out my washing machine or kill my trees. That would be counter-productive. 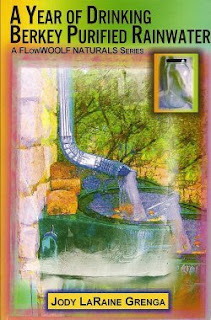 Art provides the philospohy and the How-To for greywater reuse. Dee and I attended a Design-Build-Live rain jug workshop in Austin a few weeks ago. With a chicken wire, a bag of cement, a pinch of sand and a little bit of guidance means that you can make beautiful rain jars without a kiln or a potting wheel. I have been pulling up asphalt in my backyard to encourage water retention. Turns out my soil is clay. Bummer? Nope- I can build a house or an outdoor oven. Ianto's book leaves me with a sense of peace and purpose. This is a guide for those of you who want to have your greywater system installed with city permits. This won't make it a slam dunk, but your efforts will pioneer the way for others. 1001 tips from many smart people. Edited by Jeremy Rifkin. Cover crops and poultry. How to improve your soil and feed your chooks. I am hoping to cut back on buying feed! "Fun ideas. I built mine from recycled louvered screens from a bungalow in Mahncke Park. Lots of plans for chicken tractors for those of you who aren't ready to let your chickens wander." Adapted from an Amazon Listmania by SASL member Joe Barfield. Republished with his permission. Independent Natural Resources Inc of Minnesota has been testing a a "point absorbing" wave energy converter designed to extract a small amount of energy from a portion of the wave front as the wave passes by called the SEADOG both in a Texas A&M wave pool and of the coast of Freeport, Texas. Here is a slide show of the installation of the prototype in the Gulf. As the buoyancy block moves down in the trough of a wave it draws the piston downward through the piston cylinder. The downward movement draws water into the piston cylinder through the intake valve filling the piston cylinder chamber. As the next wave lifts the buoyancy block the water within the piston cylinder is under pressure and is expelled through the exhaust valve. Each cycle of the buoyancy block rising and falling, drawing in and expelling water, is called a stroke. Each stroke of the piston causes the water to be pumped from the piston cylinder in a regular manner. 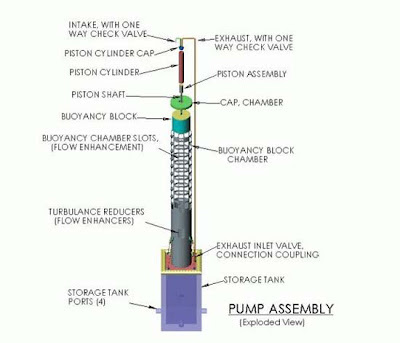 The video below shows a prototype pump. Pearl Farmers Market grand opening: May 16 , but it is open this week too. The Pearl Farmers Market will have its grand opening Saturday May 16, 2009 but it has been open for several Saturdays and will be open this coming Saturday May 9 from 9:00 Am to 1:00 PM (rain or shine). Since they carefully limit sales to locally grown foods and ranching is particularly popular in our area they really excel in natural meats. We've posted on the shrimp before. It really is miles ahead of any other farmed shrimp and is simply unavailable at the retail level except at Pearl. The Tilapia is farm raised near Hondo in a closed system . The Environmental Defense Fund places US farm raised Tilapia in their Eco-Best Category. In addition to the website, the Pearl Market Facebook group is a great way to keep up with moment by moment developments. On June 4, 2009, the Hailey Foundation will launch their new film series with the 2007 award-winning documentary by executive producers Robert Redford and Terrence Malick, titled "The Unforeseen". This environmental documentary deals with commercial over-development in Austin’s Barton Springs area which threatened plants and wildlife. There is no admission fee for the film which is exhibited for non-profit educational purposes and comment on social issues. The $15 dinner will be an Indian buffet at Madras Pavilion (I-10 @ Callaghan, by Sun Harvest) at 7:00 p.m. Thanks to Michelle, SASL member and founder of Green Drinks San Antonio for passing this information along. The Central Texas Green Building Symposium Tuesday May 12, 2009 1:00 PM - 7:00 PM at AMD, Lone Star Campus 7171 Southwest Parkway Austin, Texas 78735 is focused on commercial green building. The cost is $50.00. To register go to the cvent.com website and click on the register button. AMD, the Austin Chamber of Commerce, and the U.S. Green Building Council Central Texas – Balcones Chapter, invite you to attend a half-day symposium to learn about the latest green-building trends and explore how green building is becoming a more feasible and attractive option for new construction. During the symposium, attendees will learn from the first-hand experiences of project teams that have successfully implemented green building methods and materials into their own building designs, including challenges and opportunities. Green building experts will present three in-depth case studies of award-winning, Leadership in Energy and Environmental Design (LEED) certified projects: AMD Lone Star Campus, Dell Children’s Medical Center of Central Texas, and LCRA Redbud Center. Certificates will be available to attending architects and engineers who would like to self-report continuing education credits to AIA and the Texas Board of Architectural Examiners or the Texas Board of Professional Engineers. For more complete information including a list of nineteen speakers go to the Cevent.com site. Thanks to SASL member Dee Dee Fancher for passing along information on this event. Big Grass Bamboo at 637 W. Hildebrand (between Blanco & San Pedro) is hosting Noche Verde, an evening of festivities benefiting Build San Antonio Green, Green Spaces Alliance, USGBC and Greater Edwards Aquifer Alliance. 100% of event proceeds and 10% of all store sales between May 14-17 will be donated to Build SA Green, Greater Edwards Aquifer Alliance, Green Spaces Alliance and US Green Building Council-Central Texas Balcones Chapter. Help support the good work these organizations are doing to improve quality of life and San Antonio's future. 1) A Bed Fan from Tompkins Research. Says Joe, "I like covers on me when I sleep. This handy device blows fresh air gently under the covers. In essence, I can turn my thermostat up at night and still stay cool." 2) The Black and Decker TLD1000 Energy Series Thermal Leak Detector. "Sweet. This is a infrared thermometer with the added twist that this leak detector will flash a red light on the location of a hot air infiltration in the summer or blue for cold air in the winter." 3) The Black and Decker EM100B Energy Saver Series Power Monitor. "The B&D is the least expensive whole house energy monitor out there. Your kids will turn into detectives to figure out what is using the most energy & money." Joe previously published this material in a different form on Amazon. It is published here with his permission. This is not a traditional luncheon, but rather an opportunity to participate in a pretty historic celebration. Jigar Shah, founder of SunEdison (world's largest solar power services provider) will keynote Solar San Antonio's 10th anniversary and founder Bill Sinkin's 96th birthday. Mr. Sinkin was adamant that this event not be overrrun with corporate sponsors and that seats be reserved for individuals who are passionate about solar and renewable energy. Essentially SunEdison installs the solar system and continues to own and maintain the system. The energy user pays a fixed fee over a long term for the energy consumed. Using the contracts to purchase energy as collateral, SunEdison attracts lenders, who also benefit from a package including city and state solar rebates, accelerated depreciation benefits, and a thirty percent Federal tax write-off. The energy user benefits from a fixed energy price, savings in electricity cost over time, and reduction in carbon emissions. This win-win combination brought SunEdison from a start-up company in 2003 to a company that operates 200 commercial installations with a total capacity of 60 megawatts. Overall, from 2000 to 2007, worldwide investment in solar rose from $66 million to $12.4 billion. In the 2004-2007 period, United States investment rose from $215 million to $3.2 billion. With innovators like Mr. Shah, this level of investment will skyrocket over the next decade. Mr. Shah left SunEdison to pursue new and innovative endeavors. He will share his experience at SunEdison and his newest ideas at the luncheon on May 19. From EchoTown Launch Party by Mathew on Facebook. Please help me celebrate the Grand OPening of EchoTown.net. EchoTown.net helps our city "GetGreen!" with incentives, information and a "yes" attitude! I and many others have been working on the website and company for a few years now and finally it is a reality! Come celebrate and help us make it a big hit. Activities include Music, Art, Live Painting, eco-friendly exhibits and fun. Food and refreshments(beer and wine) will be available and Donations will help us with our goal of helping San Antonio go GREEN! Saturday May 9, 2009 from 12 pm to 8 pm at 311 Howard Street, San Antonio at Farm - Permaculture and Art. Thanks to SASL member Joe Barfield for passing this information along to our group. Labels: Events, Local Organizations, San Antonio. Lawrence Jetter and the AECT compressed earth block machine factory have long been a favorite field trip destination of our group. Now comes a three day workshop by Solar Adobe School and Tierra y Cal at the factory. Two earth building companies and their personnel are pooling their talents to bring you this class. From Texas, Lawrence Jetter and crew of Advanced Earthen Construction Technologies bring their knowledge of pressing machinery. From San Miguel de Allende, México, Jim Hallock, Mónica Healy and Jeff Rottler of Tierra y Cal, Proyectos Sustentables, bring their knowledge of lime stabilization in combination with compressed earth block construction. Students who persevere through all of the sessions to dinner on Saturday will receive a Certificate of Completion. Class cost includes an Earth Block Construction manual. 8:15am - 11:45am - How to Build a Compressed Earth Block (CEB) Building - Foundation through Bond Beam. The partners of Tierra y Cal present the step-by-step sequence using the manual you will have received. 1:00pm - 4:45pm - Soil selection and block manufacturing with Lawrence Jetter and lime stabilization with Tierra y Cal. You will have the opportunity to press and test some blocks (bring 5 gallons of your dirt if you wish), and help to operate a pressing machine. San Miguel8:00am - 11:45am - Hands-on construction of a small Compressed Earth Block building. The class will learn to build a wall to the speed lead and string and construct an arch using blocks pressed on the site. We’ll place door and window bucks and set in an electrical circuit with a few plug boxes as we build the wall. 8:00am - 11:45am - We are again at AECT’s facility with a focus on lime and clay plasters. 7:00pm - ?? - Meet for Dinner, Certificates of Completion handed out. Cost: $295.00 for one person, $275.00/person for two or more registering together and providing one payment. A discount of $20.00/person will be given for early registration, prior to May 15. Refunds (minus $30.00 administration fee) will be given for cancellations prior to June 1. This class will be conducted in English only. The class will close when filled. Please register early to preserve your place. The first payments to clear will be registered and the attendee notified.